This is a detailed explanation of a something I posted a few month ago on stackoverflow, concerning a weird behavior (a bug, in my opinion? I'd be happy to to read your opinions) of the delivery notifications in BizTalk. BizTalk has the ability to automatically publish positive acknowledgments (ACK) when it has succeeded transmitting a message or negative acknowledgments (NACK) in case of a transmission failure. 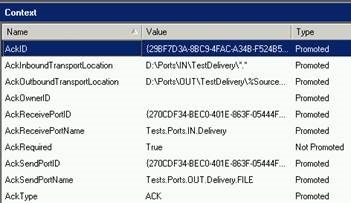 Orchestrations can use delivery notifications to subscribe to those ACKs and NACKs in order to know if a message sent on a one-way send port has been successfully transmitted. 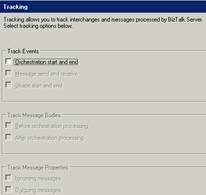 NOTE: fundamentally, those methods are strictly equivalent since the fact of setting the Delivery Notification to Transmitted on the send port only tells BizTalk the BTS.AckRequired context property has to be set to true on the outgoing message. 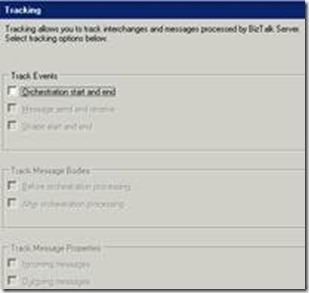 The way Delivery Notifications are handled by BizTalk is peculiar compared to the standard behavior of the Message Box: if no active subscription exists for the acknowledgment, it is simply discarded. The direct consequence of this is that there can be no routing failure for an acknowledgment, and an acknowledgment cannot be suspended. Moreover, when a message is sent to a send port where Delivery Notification = Transmitted, a correlation set is initialized and a correlation token is attached to the message (Context property: CorrelationToken). This correlation token will also be attached to the acknowledgment. So when the acknowledgment is issued, it is automatically routed to the source orchestration. Finally, when a NACK is received by the source orchestration, a DeliveryFailureException is thrown, which can be caught in Catch section. In case of a transmission failure, the messaging instance is suspended and the orchestration catches an exception (DeliveryFailureException). When the exception is caught, the orchestration does some logging and then terminates (thanks to a Terminate shape). So that leaves only the suspended messaging instance, waiting to be resumed. Once the problem that caused the transmission failure is solved, the messaging instance is resumed. Considering what was said in the reminder, we would expect the instance to complete, leaving no active or suspended instance. Those properties clearly indicate that the message being suspended is an acknowledgment (ACK in this case), which was published in the message box and was supended because no subscribers were found. This makes sense, since the source orchestration was terminated before we resumed the messaging instance. So its subscription to the acknowledgments was no longer active when the ACK was published, which explains the routing failure. But this behavior is in direct contradiction with what was said earlier: an acknowledgment must be discarded when no subscriber is found and therefore should not be suspended. It is indeed an outright bug, which appeared with the SP1 of BizTalk 2006 R2 and was never corrected since then: not in the next 4 CUs, not in BizTalk 2009, not in 2010 and not event in 2013 – though I haven’t tested CU1 and CU2 for this last edition, but I bet there is nothing to be expected from those CUs (on this particular point). This bug can have pretty nasty side effects: this behavior can be propagated to other ports, due to routing mechanisms. For instance: you have configured the ESB Toolkit and have activated the “Enable routing failure for failed messages”. The result will be that the ESB Exception SQL send port will also try and publish ACKs or NACKs concerning its own messaging instances. In itself, this is already messy, but remember that those acknowledgments will also have the source correlation token attached to them… See how far it goes? Well, actually there is more: in SQL send ports, transactions will be rolled back because of the routing failure (I guess it also happens with other adapters - like Oracle, but I haven’t tested them). Again, think of what happens when the send port is the ESB Exception send port: your BizTalk box is going mad, but you have no idea since no exception can be written in the exception database! I'm facing the same issue, but with one particular case. After the DeliveryException throwned I have a suspend shape and wait user action to solve the probem in Send Port. After the problem is solved (orchestration still exists) and start the send the port and also get the Routing failure problem. I've done what you wrote here, but I'm a little concern with performance and biztalk healthy. Did you manage to solve this in another way? Or any other advice? No, I haven't found another way of solving it, and yes for a time I was a little concerned about performances too. But I think the resource consumption overhead is minimal if you deactivate all tracking on this new orchestration - this "patch" is deployed on some production environments I know, without any significant difference in performance. 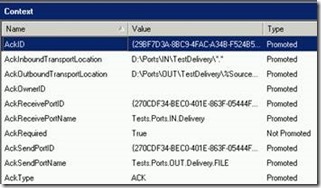 Moreover, if you really need those delivery notifications, the problem is simple : wether you take the risk of lower performances (but that can be measured with proper testing, and certainly managed by fine tuning your hosts), or you accept that your BizTalk box will potentially behave in a funny way! Please do keep me informed about what Microsoft thinks of this issue!